Reinventing plant-based eating is what Tal Ronnen is all about. At his Los Angeles restaurant, Crossroads, the menu is vegan, but there are no soybeans or bland seitan to be found. He and his executive chef, Scot Jones, turn seasonal vegetables, beans, nuts, and grains into sophisticated Mediterranean fare—think warm bowls of tomato-sauced pappardelle, plates of spicy carrot salad, and crunchy flatbreads piled high with roasted vegetables. 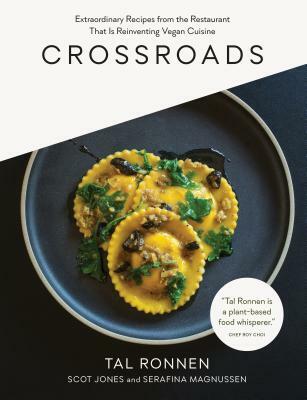 In Crossroads, an IACP Cookbook Award finalist, Ronnen teaches readers to make his recipes and proves that the flavors we crave are easily replicated in dishes made without animal products. With accessible, unfussy recipes, Crossroads takes plant-based eating firmly out of the realm of hippie health food and into a cuisine that fits perfectly with today’s modern palate. The recipes are photographed in sumptuous detail, and with more than 100 of them for weeknight dinners, snacks and appetizers, special occasion meals, desserts, and more, this book is an indispensable resource for healthy, mindful eaters everywhere. Tal Ronnen, founder and chef of Crossroads Kitchen in Los Angeles and author of the New York Times bestseller The Conscious Cook, became known nationwide as the chef who prepared the meals for Oprah Winfrey’s 21-day vegan cleanse. He has made his culinary mark at a number of high-profile events, having catered Ellen DeGeneres and Portia de Rossi’s wedding, Arianna Huffington’s party at the Democratic National Convention, and U.S. Senate dinners. A graduate of the Natural Gourmet Institute, Ronnen is the co-creator of Kite Hill Cheese, the first nondairy cheese sold at the high-end cheese counter at Whole Foods, and is a collaborating chef at the Wynn and Encore hotels in Las Vegas. “This beautifully photographed collection of 100 Mediterranean-inspired recipes captures the spirit of [Ronnen's] restaurant, and shows how sophisticated vegan cuisine can be in the hands of someone who is trained in classical French cooking. But these aren't overly complicated chef recipes with long lists of unfamiliar ingredients. And these aren't dishes centered on faux meats or tofu. Instead, these are dishes that put vegetables front and center, showing how glorious vegetables can be." —Michael Voltaggio, chef and owner, ink.